We managed to get our hands on the HTC Flyer at Yappe Computer, Serusop, and it seems like a good 7" Android Tablet: an alternative to the older Galaxy Tab. 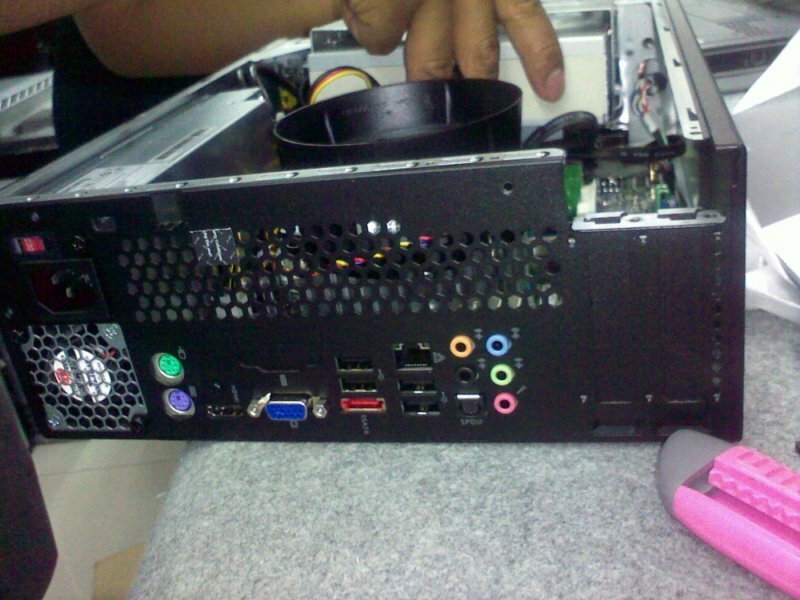 It’s selling for B$859 (cash price) / B$886 (credit card price) for the 32GB model. While it is a 7" Gingerbread (2.3) tablet instead of Honeycomb (3.x, which is the tablet optimized version of Android) it seems to be the better choice at the moment as apps will run on it with the only issue may be the way it looks. Currently is only one 7" Honeycomb tablet: the Acer Iconia Tab A100 and it was released yesterday. It is the first device to have Android 3.2 which is supposed to provide better support for 7" tablets compared to the regular bigger 10" Honeycomb tablets. However there seem to be some force close issues and app incompatibilities reported by This Is My Next and ZDnet (i.e. more work for the developer to fix problems). While I wished they didn’t remove the calling ability of the device, the usability of the pen to annotate and take notes is pretty appealing. 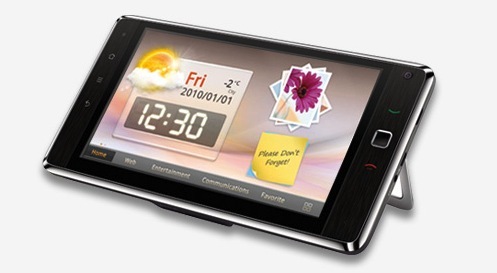 A good alternative to the Galaxy Tab if you don’t plan to use it for calling. Smaller and more portable than an iPad it is made more for mobility. The main reason to get this device is the active digitizer and stylus combo or if you just wish for a tablet faster than the Galaxy Tab whose age is showing. Nice to see HTC innovate with the Flyer and hope to see more with the upcoming Puccini, their shot at the 10" tablet category. I doubt this will get any future upgrades because it is an older model and Huawei is releasing an S7 Slim and also the recently announced Media Pad. The main issue with the device will be the battery life: having a removable battery aids it but then you will have to buy another battery and external charger to keep it running. I was contemplating on the device and using it as a mobile hotspot with my b-mobile Zoom! SIM card and using it as a tablet for reading and on the go computing. However with the possible battery life issues, the best bet for my use case is still the Samsung Galaxy Tab which will cost about B$250 more but you get better hardware and a better overall experience. But having said that, I believe this is the cheapest 3G and Flash enabled Android tablet in Brunei. If you’re looking for a budget all-in-one phone and tablet device, and don’t mind the possible battery life issues, this is a good deal. Want a computer to trade-in? 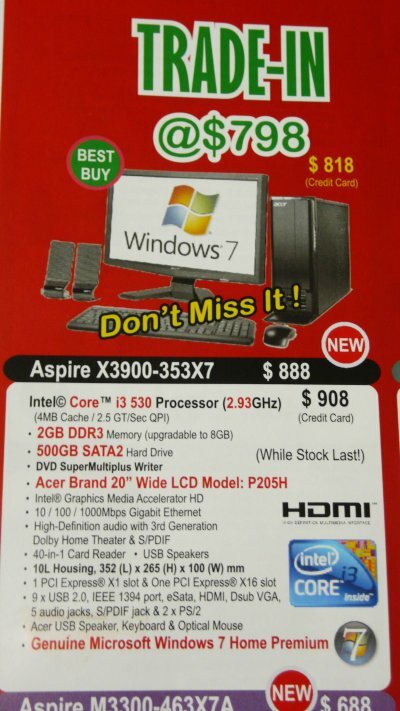 So Concepts Computer is having another trade-in offer at the moment: get an Acer Aspire One Happy for only B$398. I always love this trade-in offer as it gives people a chance to get rid of their old non-working computers and get discount in return. If you can’t get the trade-in offer, it is still going for B$468 under their Anniversary Special Deal. I have some notebooks that meet this requirement and am willing to give them to anybody who wants to take advantage of this good offer. Anybody interested leave a comment / email me (tim _AT_ thewheatfield.org) / tweet me @thewheat and we’ll be in touch. 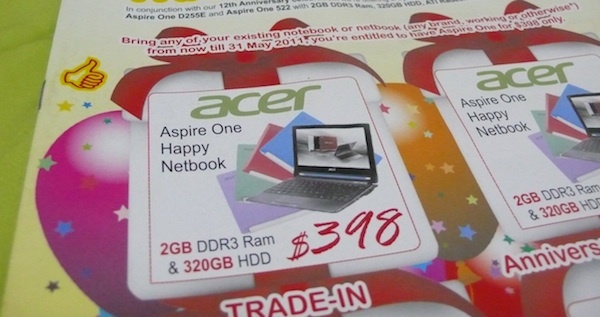 Bring any of your existing notebook or netbook (any brand, working or otherwise*) from now till 31 May 2011, you’re entitled to have Aspire One for $398 only.